Making the most of her international upbringing, Kathy has lived in the British Virgin Islands since 1993 where she has specifically served vacationers’ needs. She has a background in managing small hotels and extensive experience of working in the charter industry, followed by 10 years as co-owner and chef / first mate of a 48-foot crewed charter catamaran. Kathy has sailed all year round throughout the British Virgin Islands and the waters of the Eastern Caribbean, including St. Bart’s, St Maarten, Antigua, St. Kitts, St. Lucia, St. Vincent & the Grenadines and Grenada. But in 2004 she decided to take her already successful catering career onto dry land. Having lived in the charter capital of the world, Kathy has her finger on the pulse of the British Virgin Islands and is uniquely qualified to match your personal style, preferences, and budget to suit the perfect boat, crew or venue. 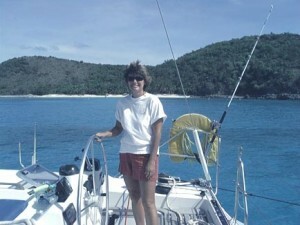 Kathy can provide you with a crewed charter sailing vacation and treasured memories that will last a lifetime.